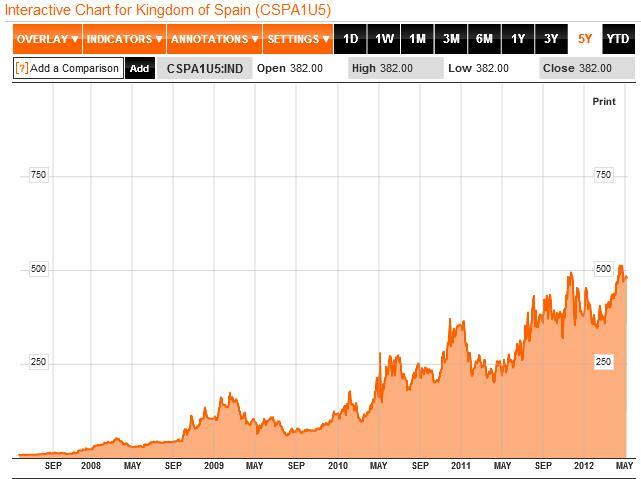 The following chart of Spain’s default risk (CDS) shows the persistent rise over the last few years. And with S&P’s two notch downgrade of Spain in late April, Bankia (Spain’s fourth largest bank) has imploded. After “auditors Deloitte refused to sign off the bank's books, amid allegations of €3.5bn (£2.8bn) of inflated assets”, the Chairman resigned and the bank was nationalized. The problem is not with just one bank. Reform measures for bailing out the rest of the Spanish banking system will be detailed this weekend. With “a 1.7 trillion-euro loan book, one of the world’s largest” based on “a housing bubble twice the size of the U.S.”, Spanish authorities will have their work cut out for them. Especially, since their own finances are being called into question and Spain is officially in a recession. If this sounds familiar, it’s because Wall Street, realizing that it was in trouble with subprime loans, proposed to do the same in April 2008. Lehman, days before it’s failure, also put forward this solution. This private ‘bad bank’ idea failed twice when it came down to determining how to and who will pay for it. We expect it will fail again. Spain’s troubles are also enhancing risks in Italy. In both of these countries, increased borrowing causes bond yields to rise, provoking downgrades, providing losses to their banking system, which causes policy makers to borrow more for bailouts. It appears bankers and authorities are once again locked in to the downdraft of a deflationary maelstrom. As you can see from the stock index chart below, Italy (EWI - spicy mustard) and Spain (EWP - brown) are sitting at their 2009 lows. France (^FCHI - blue) is not too far behind. Compare this to Germany (^GDAXI - red) and the U.S. (S&P500 - green) which have obviously held up better. All are trading in a similar fashion and will converge as we get closer to the bottom. The Greece composite index (which wouldn’t even fit on the previous chart correctly) is down 88% from it’s 2007 highs. These are the kind of deals available to investors who are aware of long term historical cycles and have available cash on hand. 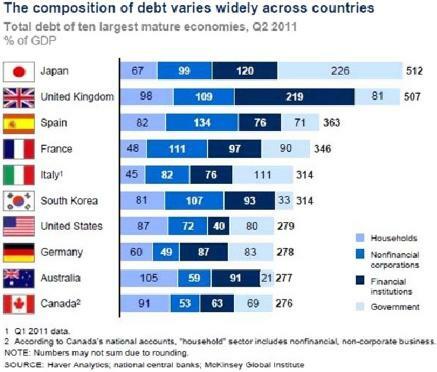 As you can see from the chart below, we have a tremendous amount of global debt to shed. As we described in February 2010, when the financial system breaks down, stocks fall distinctly. It appears Dr. Marc Faber agrees. back to 17 times earnings from its level then of 28 to 35 times, it would guarantee a major bear market. Much more remarkably, only 7 voted that it would not go back! Thus, more than 99% of the analysts and portfolio managers of the great, and the not so great, investment houses believed that there would indeed be “a major bear market” even as their spokespeople, with a handful of honorable exceptions, reassured clients that there was no need to worry.” - Jeremy Grantham. “My Sister's Pension Assets and Agency Problems (The Tension between Protecting Your Job or Your Clients' Money).” April 2012. Back in January, we began comparing the investment herd to the buffalo that were stampeded over the cliffs of the Great Plains. Last month, we elaborated on this theme and declared that the herd was “Over the Cliff!” Steven Spielberg’s Into the West shows this buffalo jump (0:24-6:26). Curiously, the current political exchange is also on the same subject.